A wiki is a collection of web pages that allow users to add and edit content collectively. You may use wiki technology within your Blackboard course. This guide covers using wikis from understanding the user interface to creating a wiki page. This guide explains how to set up Wikis for your whole course to use. 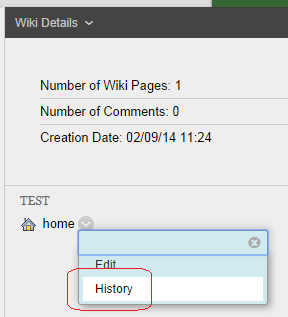 Find out how to link between pages within a wiki. This guide explains how to enable a wiki for course groups that you have already created. This guide will show you how to add a Wikis entry to your course menu. It will also show you how to add a direct link in your course menu to a specific wiki. A course wiki can be accessed by any course member. You can turn on or off the ability for students to edit the wiki. 1. Find a content area where you wish to add a wiki. Hover over the Tools menu and choose Wikis. 2. Click on Create New Wiki. 3. Enter a name and instructions for the wiki. Ensure that you tell your students what use you expect them to make of the wiki. 4. Check that Wiki Availability is set to Yes, otherwise students will not be able to access the wiki. 5. If you wish you may set date limitations on when the wiki is available. 6. If you wish for students to be able to edit the wiki choose Open to Editing. 7. If you wish for students to be able to add comments to pages choose Open to Commenting. 8. If you would like a Grade Centre column to be added for the wiki enable the Grade option and set the total number of points possible. 10. Check that your wiki is listed in the box and that Link to a Wiki is selected. 12. This next page is about how the link to the wiki will be created. Set a colour if you wish and click on Submit. 13. Your wiki is now created. 14. If you should ever wish to modify the wiki options, or even just view all the wikis on your course, expand the Control Panel’s Course Tools area and click on Wikis. This will show a list of all wikis within your course including Group Wikis. To change Wiki options click on the Modify button beside the Wiki and choose Edit Properties.